SAN FRANCISCO - May 4, 2018 - PRLog -- Loop AI Labs, a Silicon Valley company ranked as the leading provider of unsupervised cognitive computing technologies, has entered into an agreement with LINK Mobility, the leading European provider of mobile messaging and solutions. The partnership will bring the power of cognitive computing and artificial intelligence to LINK's 16,500 Enterprise and Small Medium Business clients, serving 234 million people. Loop AI Labs is one of the leading providers in the cognitive software industry with operations in Asia, Europe, and the USA. Loop Q, the flagship product, serves Global 2000 along with other large enterprises. It helps augment workforce productivity and automate repetitive processes previously managed by humans in all departments, typically retrofitting the existing enterprise legacy systems. Artificial intelligence is creating new ways for people and businesses to engage with one another. AI is already powering some of the world's most popular consumer experiences. By leveraging Loop AI Labs' platform Loop Q, LINK Mobility will soon bring ready-to-use cognitive capabilities into sales, customer support, marketing and other functions, empowering businesses of all sizes to augment their teams, automate certain repetitive tasks, and deliver truly personalized customer experiences with no additional effort from customers. "By introducing cognitive capabilities into our current portfolio of mobile intelligence solutions we make it easy for everyone to take advantage of best-in-class artificial intelligence capabilities that are fully integrated with our advanced Mobile Messaging and Mobile Solutions in the context of their business", says Thomas W. Köhl, Vice President Mobile Intelligence at LINK Mobility Group. With Loop Q, GDPR compliant cognitive capabilities will be embedded across every LINK Mobility service and solution. LINK Mobility leverages all the data on its platform—activity data from chatbots, calendar, marketing and e-commerce, social data, and even IoT signals—to continuously train Loop Q in real time. Because LINK Mobility commercializes operations that are serving millions of people every day, it is uniquely positioned to deliver the best mobile cognitive services, even for those businesses that on their own would not have enough data. Powered by advanced machine learning, deep learning, predictive analytics, natural language processing, and smart data discovery, Loop Q's breakthrough innovations allow data models to be automatically built from scratch and customized for every single customer in their respective language without human supervision. LINK Mobility's cognitive services built on top of Loop Q will learn, self-tune, and get smarter with every interaction and an additional piece of data. They will automatically discover relevant insights, predict future behavior, proactively recommend best next actions, and even automate tasks. Now every LINK customer will be able to leverage advanced AI capabilities to deliver more personalized and predictive customer experiences. "Loop AI Labs' mission is to turn any organization into a cognitive business so that it can meet the future demand of knowledge workers and augment the capacity of the current employees. I'm glad that thanks to LINK Mobility, we can deliver our vision to thousands of more companies of any size serving millions of people, in addition to the Global 2000 enterprises that we currently serve directly", said GM Calafiore, CEO of Loop AI Labs. "I strongly believe that AI will prove very valuable to LINK´s European customers. 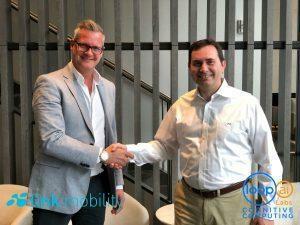 LINK will be way ahead of comparable solutions in Europe, and I am therefore very proud to announce this partnership with one of the world´s most exciting artificial intelligence companies, Loop AI Labs. I am also grateful that Loop AI Labs has chosen LINK as its European partner. This confirms LINK´s core strategy of becoming the preferred partner within this space in Europe. This new partnership takes LINK another step into the future and ensures that LINK shall be the most innovative provider of advanced mobile messaging and solutions in the European market. LINK is at the forefront of the industry with our wide range of attractive products and services. This looks very promising for the years to come and will benefit our customers greatly." says Arild Hustad, Group CEO of LINK Mobility.